NEW DELHI: US manufacturer Textron is winding down its defence operations in India after being hit by penalties for failing to meet stringent offset guidelines and seeing a bleak revenue stream in the country. The company — which makes a range of military products from the famous Bell range of helicopters to the cutting-edge V22 Osprey and the Beechcraft T-6 Military Trainer — is looking at closing its corporate office in the capital but will maintain a presence with its engineering facilities in Bangalore, according to two persons familiar with the matter. 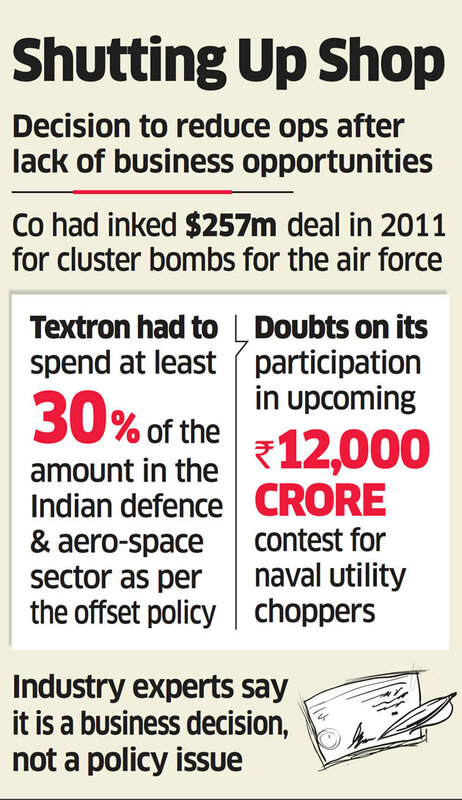 Textron, which has already supplied CBU 105 Sensor Fuzed Weapons to the Indian Air Force, was recently penalised $300,000 by the defence ministry for not meeting offset obligations. The company had announced a $257-million deal to supply 512 Sensor Fused weapons in 2011 and was obligated to spend at least 30% of the amount in the Indian defence and aerospace sector as per the offset policy. The air-delivered cluster bombs are designed to take down multiple targets spread over a large area. The ministry has determined the company did not meet the offset commitment and could face a larger fine of $8 million in the future if the issue is not resolved, informed sources told ET. The penalty was levied from the $12.85 million bank guarantee that the company had given at the time of signing the contract. While queries to Textron went unanswered, sources said the company could now run defence operations in India from a regional office. The decision has also raised doubts over Bell Helicopters’ participation in an upcoming Rs 12,000 crore contest to make new naval utility helicopters in India where it was a primary contender. The company was in talks with Tata Advanced Systems Limited (TASL) for the contract. Failure to comply with offset regulations have hit US companies hard, with aviation giant Lockheed Martin facing penalties of half a million dollars in the recent past. Industry experts believe that there is a case to ease offset guidelines. Aghi said Textron’s decision wasn’t dictated by the policy. “For Textron, they are not able to generate revenue. It is a business decision, it is not a policy issue,” he said. Textron has struggled to pick up more defence orders after the 2011 success for cluster bombs despite having offered several solutions to the armed forces, including its Scorpion light attack jet and the T-6 trainer. Initial discussions were also carried out for the multi-mission tilt rotor V22 Osprey that it manufactures in partnership with Boeing.